It's at ground level near the elevator at Cold Storage's end. There's also some competition that you can take part in, but prior registration is required. 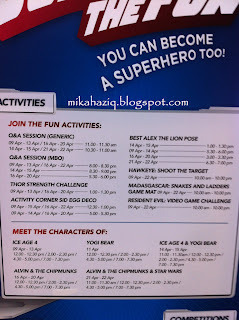 Best Alex the Lion pose seems interesting but my kids are no extroverts. 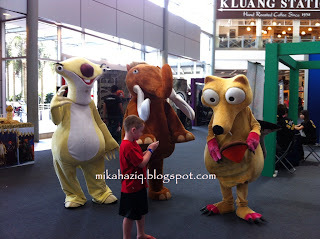 I stayed for a bit to check out Meet The Characters of Ice Age to see whether it's worth it to bring my kids over tomorrow but hmm... the only characters I saw was Manny the Mammoth, Sid the Sloth, who was taller than the Mammoth, and Scrat the Squirrel. I was more interested in the sabre-tooth tiger and mammoth and since the mammoth was well not a mammoth and there is no sabre-tooth tiger, I won't go out of my way bringing my kids to Ikano Power Centre just for that. But, if you are staying nearby IPC, and always there for dining, shopping or buying groceries, then you might want to coincide your timing with the schedule to amuse the kids this weekend in KL.